If you have an essay due on Operations Management and Logistics and if you would like a good, custom written paper on your precise topic at a reasonable price, you are at just the right place. Our writing service can help you with an A+ paper. Logistics can be defined as “a business planning framework for the management of material, service, information and capital flows. It includes the increasingly complex information, communication and control systems required in todays business environment” (Logistix Partners OY, 1996). Originally it was a military term connected with the planning and operation of movement and maintenance of the military forces. But now the term has been absorbed by the business operations management to denote the procurement, maintenance, distribution and replacement of personnel and material ( Webster’s Dictionary). Corporations use logistics to manage the flow of their products from the point of origin or the source to the point of consumption or use. The different sections of department in corporations include inventory management, warehousing, transport, material handling, packaging and security. Frequent questions are asked about the differences or similarities between logistics and supply chain. There are different views regarding their relationship. Four perspectives of this relationship are: the traditionalist, re-labelling, unionist and inter-sectionist. The tradionalists claim that Supply Chain Management is small part of logistics. However, the Unionists view that logistics as a small part of Supply Chain Management. The Re-labelling perspective states that SCM is simply a re-labelling of logistics. 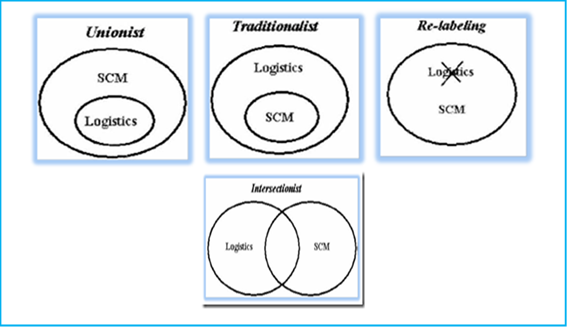 But, the inter-sectionist view holds that there are areas in both logistics and SCM that overlap (Larson & Halldorsson, 2004). Stock & Lambert (2001) suggest that the ‘‘supply chain management is the management of eight key business processes:(1) customer relationship management, (2) customer service management, (3) demand management, (4) order fulfillment, (5)manufacturing flow management, (6) procurement, (7) product development and commercialization, and (8) returns’’. These processes include a lot of areas that are part of logistics, purchasing, marketing and operations management. Logistics can be divided into two sections: inbound and outbound. The inbound deals with the purchase and transport arrangements. These are the transport of materials, parts or finished inventory from the suppliers to the place where they are manufactured, warehoused or retailed. Outbound is concerned with the storing and transport of the end product to the consumer. Hence, it is connected with the various business operations such as procurement, production, distribution, after sales and disposal. The main credo of logistics management is to supply the right item, in the right quantity, at the right time, at the right place, for the right price, in the right condition to the right customer. Logistics management is a part of the Operations Management course. Professional logistics practitioners are in demand in many companies, airports, freight forwarding companies, in the logistics department of corporations and as consultants in fourth-party logistics. Writing an essay on logistics and supply chain management or on other topic of your course is easy if you order your custom papers from our custom writing service. Research paper topics and research paper outlines on Operations Management are also available from our custom essays services. All research done by Customessaysservice.com should only be used for research purposes. Research provided should not be submitted as your own. If you do however choose to make use of our research to write your own essay, it should be properly referenced.